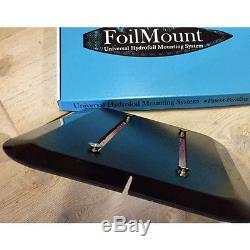 Want to get into foiling? We created this package for you! 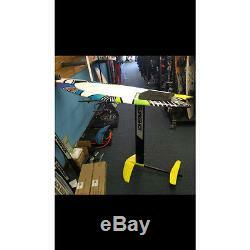 The package comes with the Slingshot Hover Glide, 2013 Liquid Force Kite Fish 5'3, Hover Glide Wing Foil Set, a 24 and a 15 mast making this package an ideal choice for wake foiling and an adhesive Foil Mount. Add some straps to customize your setup. The Kite Fish is almost identical to Liquid Force's older Foil Fish board which they used as their main and only foilboard for the first few years. The adhesive Foilmount makes converts it to a great foil board. The Hover Glide is same foil that comes stock with the Slingshot Wakefoiler. The boards are yellow and green like the one pictured in the assembled photo. ALL PRODUCTS ARE NEW IN BOX. The Hover Glide What we think: The most versatile foil setup available. With lots of new modular items coming out soon, Slingshot is on top of the hydrofoiling revolution. The Flight School is the best way to learn hands down. Check out foil-academy for FREE throug Slingshot's website. The Hover Glide is super sturdy with a bit of weight. This weight does not have a negative impact on performance. We find the momentum can actually be helpful at times. You will soon be able to switch out Surf, SUP and Windsurfing wings with this setup. This is a great all around wing. We have been using it for kiting, surfing, tow-ins, and wakesurfing. The wing is identical to the wing offered in Slingshot's Wake Foil. The ideal mast sizes for wake surfing are the 15" and 24". For surfing the 24" or 30" seem to be the way to go. You can easily mount this setup to any existing board with the Foil Mount for hydrosurfing, wakefoiling or kitefoilng. An excellent choice for any foilboarder or prospective rider. The tough aluminum mast is durable and interchangeable. CNC wing sets on the Hover Glide have been engineered to give you maximum speed and lift while retaining their durability. We have found that this board planes faster than others in the aluminum/cnc category. The black and green stock colors really pop in and out of the water. All around this is an awesome investment whether you are just learning or you need a backup foil for shallow, potentially damaging conditions. From the Brand Slingshot Note: Comes in green, yellow, or orange. You can put in a request in the comments section at checkout and it will be granted if available. Description Durable, affordable freeride foil: The 2016 Hover Glide is an all-around freeride foil with a versatile performance profile and aluminum and composite construction, making this the most well-rounded and robust foil on the market. The Hover Glide is also the exclusive foil for Slingshots progressive multi-mast Foiling Flight School program. With the Hover Glide, you get: Access to the highly-effective Foiling Flight School program · A user-friendly foil you can learn on but wont outgrow · An agile and playful foil that planes early and has a medium top-end speed · Durable aluminum, composite construction · Segmented design for easy set-up and breakdown · The ability to foil in shallower water with four different mast lengths to choose from · Affordable replacement parts if needed Mast+ fuselage height: 93cm (36.6) Combined total weight: 5.2kg 11.46 lbs. Kite Fish The board that makes marginal days fun and good days great! This unique board defines its own category. Starting with a full-sized fish outline, kite specific rocker and twin-plus trailer fin. This board also works well as Wakesurfer (skurfer). 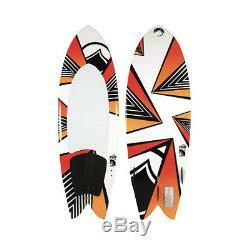 It is the same design as Liquid Forces wake surfer just with inserts for straps. Set up, combined with LFs ultra durable capped construction makes this a great board for small sloppy surf, rolling river swell, or light wind cruising. Plus a price that makes adding this board to your quiver a no brainer. Comes with inserts and straps. Board highlights: CNC cut core, bombproof cap construction, V bottom contour, EVA grip, surf straps. SIZE: 53 Kite Fish Features Compression molded bombproof construction Asymmetrical heel and toe edge Single concave asymmetrical bottom contour Integrated thumb rail deck contours Continuous rocker profile Offset inserts Beautiful sublimated UV resistant graphics RSX 2.0 fins Foilmount Ridge What we think: This is great for mounting your GoFoil, HoverGlide, MHL Lift, Zeeko or any other track mounted foil setup to your surfboard, SUP, skimboard and any other board! If your board has a little curve to it where you are looking to mount, then the Ridge Foilmount is way to go for a little more flexibility over the Standard Mount. The FoilMount is a universal hydrofoil mounting system, this means that you can put a hydrofoil track on just about any board you already have. The FoilMount uses a specially designed 3M adhesive tape to stick to the bottom of your board. It will accommodate any foil that uses the 90mm track system (this is industry standard). It is a easy way to fix a broken track system. It is also great for retrofitting boards with through bolt holes to give them the adjust-ability of a sliding track system. The FoilMount can be removed but cannot be reused. It is very easy to install, just prep the surface with alcohol, peel the backing on the tape, and stick onto the desired location. Ridge Mount FoilMount This is the standard mount with a relief cut down the middle allowing for a mount on top of a ridge on the bottom of the board. The surface still needs to fairly flat, but allows for a slight ridge where the FoilMount will be installed. It is suitable for most SUP boards, hydrofoil boards, Skim boards, Surfboards. The Standard includes: FoilMount plate with adhesive backing 4 high strength brass slider nuts 1 set of 4 flat head M8x16mm bolts for Slingshot and most other foils 1 set of 4 flat head M8x20mm bolts for newer Liquid Force foils 1 set of 4 pan head M8x20mm bolts for Moses and older Liquid Force foils. 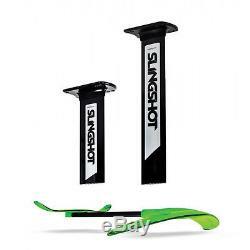 The item "Slingshot & Liquid Force Wakefoiler for hydrofoiling behind the boat. 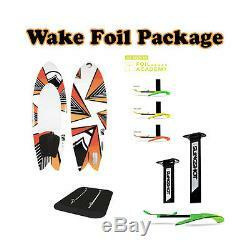 Wake Foil" is in sale since Tuesday, June 20, 2017. This item is in the category "Sporting Goods\Water Sports\Wakeboarding & Waterskiing\Wakeboards". The seller is "boschoss" and is located in Cocoa Beach, Florida. This item can be shipped to United States, Canada, United Kingdom, Denmark, Romania, Slovakia, Bulgaria, Czech republic, Finland, Hungary, Latvia, Lithuania, Malta, Estonia, Australia, Greece, Portugal, Cyprus, Slovenia, Japan, China, Sweden, South Korea, Indonesia, Taiwan, South africa, Thailand, Belgium, France, Hong Kong, Ireland, Netherlands, Poland, Spain, Italy, Germany, Austria, Israel, Mexico, New Zealand, Singapore, Switzerland, Norway, Saudi arabia, Ukraine, United arab emirates, Qatar, Kuwait, Bahrain, Croatia, Malaysia, Brazil, Colombia, Panama, Jamaica.